Our guide to playing the new take on Evolve Token Shaman in the Rastakhan era. 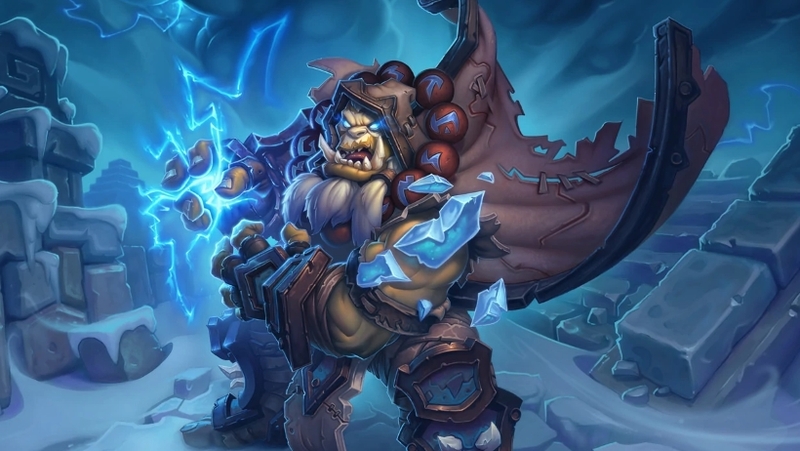 Our Evolve Token Shaman deck list guide features the best Rastakhan deck list for Season 57 of Hearthstone (December 2018). Our Evolve Token Shaman guide also contains Mulligan advice, card combos and strategy tips. Token Shaman (or Evolve Shaman) is a Hearthstone deck that's by no means a new archetype for the game, although it's fair to say that it's been in the wilderness for a little while. With the release of the Rastakhan’s Rumble expansion, the intention behind the deck remains mostly unchanged, although the Shaman’s now got a few more tools to evolve and empower its smallest minions into threatening menaces. In this revised version of our Token Shaman guide, we're highlighting a theorycrafted version of the deck that should prove a good starting point for the Rastakhan’s Rumble launch. We'll also be tweaking this list in the days leading up to to the new meta, and adjusting the rest of our guide to match those changes. To get you started we've got an overview of the deck itself, detailed insight into how to actually play it, and Mulligan advice to help you pick your starting hand. We've also got a look at all the combos contained in this deck, and some final thoughts on card choices and possible substitutions. We wanted to bring you an updated post-launch version of Evole / Token Shaman so you could get stuck into an alternative take on it right away. It’s still subject to change, of course, in the coming weeks so careful with your crafting dust. This is a version of Token Shaman that we expect to see play Standard ladder. We'll have more updates coming over the next few days as the deck is further refined in the early stages of Rastakhan’s Rumble. The strength of Token Shaman lies in building up a wide board of small minions and then using buffs or evolve effects to overwhelm your opponent by massively increasing their power. Many cards in the deck take advantage of large boards, including Bloodlust, Flametongue Totem and Thrall, Deathseer. With the release of Rastakhan’s Rumble, a number of new tools were added to the Token Shaman’s arsenal that makes it easier for you to more consistently evolve and empower your minions. Many of these small early game threats can quickly escalate into powerful late game minions in a matter of turns leaving your opponent unable to deal with the vast power level on the board. Early game: Start to develop a board as quickly as possible with your early game minions, and seek out efficient trades with your opponent’s creatures to establish control. Pairing cards like Fire Fly or Primalfin Totem with Flametongue Totem can make your smaller minions even more effective in the early stages of a game. Voltaic Burst is also a very effective spell to use for minion trading. Mid game: Continue developing your board and buffing your minions where possible. You can continue going wide on the board with cards like Saronite Chain Gain or if you have a board well established you can also play Thrall, Deathseer and transform all your minions into ones that cost two more Mana for a big swing turn. Now’s also the time to look for a Corridor Creeper if it’s been discounted enough. Some of the deck’s new cards come into play at this stage too: New legendary minion Zentimo pairs excellently with Unstable Evolution and Big Bad Voodoo to hit multiple creatures on your side of the board for some solid evolve value that should extend your lead even further. Late game: If your opponent has kept you under control and you need to restock then Rain of Toads can be very good at getting a significant presence back on the board quickly. Spirit of the Frog can help you draw through to some of the most important spells in the deck too Otherwise, the combination of a huge board of minions plus either Bloodlust or The Storm Bringer should usually be enough to seal victory in the mid-to-late game. 1. When contesting the board at the start of the game your buffed minions can outvalue theirs and give you the early advantage. 2. The Sparks you can summon with Voltaic Burst and Thunderhead are ideal for trading into the other player’s low health minions. 3. Saronite Chain Gang and Rain of Toads are both excellent cards to slow down aggro decks with. 4. Hitting many of your minions with evolve effects from Thrall, Deathseer or Zentimo and Unstable Evolution will usually give you big advantages over the smaller creatures in aggro decks. 5. If you find yourself in a position where you need a race, an early Bloodlust is usually better than holding off and leaving it too late for them to finish you off first. 1. Take a more aggressive approach to the game and push for extra damage where you can to reduce their life total before they can stabilise. 2. Be cautious of overcommitting on the board and running into a potential board clear. Save some resources so you can reload if needed. 3. A huge burst of surprise damage through Bloodlust is your most likely win condition, so save it for when you have the kill in sight. 4. Similarly, if you get a monstrous board from The Storm Bringer it’ll be very difficult for your opponent to get back into the game - even with their board clears. 5. Eke out every last bit of damage you can to get ahead, even from seemingly inconsequential elements such as Sparks after the Rush restrictions no longer apply. 1. Fire Fly: A really solid one drop that’ll get you on the board early and can be buffed by other cards to trade up into your opponent’s minions. 3. Primalfin Totem: Can start generating Murloc tokens for you nice and early the sooner you get it down. 4. Flametongue Totem: Buffs the attack power of your smaller minion so they can trade with your opponent’s or push for early damage. 5. Zentimo: You’ll want to pair this up with Unstable Evolution or Big Bad Voodoo for the greatest effect, but it’s worth a hold if you come across it in your mulligan. Even if you played a great deal of Token Shaman in the past, you'll want to re-familiarise yourself with all of the new and old combos. Whenever we update our recommended deck list we'll also make sure those changes are taken into account in this section. - Flametongue Totem increases the damage output of the minions either side of it by two points. Watch your positioning of this totem, as you may need to cycle a number of your minions into a problematic target at some point. - Each time you play a card with Overload, Thunderhead will summon a pair of 1 / 1 minions with Rush, meaning they can attack enemy minions but not the enemy hero on the turn they appear. Overload cards in this deck are Voltaic Burst and Rain of Toads. - Bloodlust is one of your core finishers in this deck and will grant all minions on the board a temporary Attack bonus of three. Do your sums very carefully to ensure you do not overlook lethal damage. - When The Storm Bringer is cast all of your active minions will be transformed into randomly chosen Legendary minions. - Thrall, Deathseer transforms all of your active minions into random minions that cost two Mana more. You also gain a new Hero Power which - like Unstable Evolution - allows you to upgrade a single targeted minion on the board. Note though that you can only use this effect once per turn. - Zentimo is a card you’ll never want to play on its own as its so easy to kill. Always save it and pair it with a spell so you get some value. There are great combos available with Unstable Evolution and Big Bad Voodoo to hit three of your own minions. Or you can combine it with Hex to turn three opposing minions into useless frogs. - Corridor Creeper is reduced in cost by one for each minion that dies while it’s in your hand. As you’ll be playing lots of cheap minions the cost of this can be reduced fairly quickly allowing you to set up a huge tempo play later in the game. Fire Fly: Strong early game minion that pairs perfectly with Earthen Might to get a lot extra value in trades. Unstable Evolution: For one mana it’ll transform a friendly minion into another that costs one mana more. It’s also repeatable if you have the mana spare, meaning you can scale something up fairly rapidly. Big Bad Voodoo: An opponent may feel good about killing one of your minions, but it won’t feel so great if that creature will then evolve into another at one mana cost higher. Primalfin Totem: Can generate a lot of 1/1 Murlocs for you to use in trades or to build up a strong board. Zentimo: Allows you to get a little extra value out of your single target spells by spreading them to adjacent minons. This is especially effective with removal or buffs on your own minions. Bloodlust: The deck’s first key win condition. Once you’ve built up a powerful board you can activate this to obliterate your opponent’s life total. Thrall, Deathseer: Can improve the minions you have on board by evolving them into ones that cost two more, which should get you even further ahead. Krag’wa, the Frog: This provides you with some insurance if you need to use spells early as it’ll add any played on the previous turn back into your hand. You shouldn’t feel too bad about spending that Bloodlust early, now. The Storm Bringer: The deck’s other potential win condition. An unlucky roll might disappoint, but getting anything like three or more Legendary minions for seven Mana is incredible value. @oDrew Interesting, I'll try and give this one a roadtest this week. I know Nerubian Prophet isn't popular, but what I like about it is the consistent cost reduction that doesn't require anything besides drawing it. Plus, 6-cost minions either become 8 drops with Thrall or 10 drops with Murmuring Elemental + Thrall, and with 10-drops there is much less risk of rolling terrible value. Ideally, you draw a Creeper plus minion-generating minions (Primalfin, Fire Fly) early to discount it as quickly as possible, plus an early Prophet to get the discount going. Then, you can use an early Evolve to get an 8 drop, and save your Prophets for free 8 drops or 10 drops with Thrall or Murmuring + Thrall. If you're playing against a class with poor waveclear, you can get lots of value with 2-turn combos like Dopple + Grumble, Saronite + Grumble, etc. Two questions: first, how does Bloodsail Corsair buff your weapon? Secret battlecry? Second, I don't get dropping down to one devolve. It just does so much damage to your opponent, and taunt is so prevalent right now. With Bloodlust frequently serving as the win condition in this deck, I almost prefer devolve to evolve. (So you devolve to remove the taunt minions, cast bloodlust, and go face for lethal.) In practice, dropping one devolve has really led to more wins? The deck list has been updated with the most popular version in play. The rest of the guide has also been updated to reflect those changes. @grobson Hi there - good spot, thanks! I meant Evolve and have made the change. Not sure why the card isn't showing up, I'll have to have a poke around in the system and see what's going on here. I've just given this another checking over for meta-relevance and...nothing's changed! The deck list's settled down now, so just carry on as you were. It's a bit of a middling deck though, so you might want to think about switching over to Token Druid if you like the playstyle, but are struggling to make progress on the ladder. @erikmuench38 I'm not sure if the Patches package is still worth running if you don't have Patches. But you can try running Glacial Shard. Or a Bloodsail Corsair. Or maybe even try cutting a few of the cards for the murloc package, the Finja + Warleader + Bluegill. Warleader has good synergy with Prinalfin as well. @erikmuench38 I'm not sure whether to suggest you replace them with your best 1-Mana early game minions (to start spreading the board), or your best Charge minions so you get the greater amount of burst damage later on. Obviously you have to consider the Mana impact of playing later cards alongside Bloodlust. I played this deck enough to understand the way it works for the purposes of a starter guide, but not dozens of games by any means. Anyone else have any thoughts? What can you sub for Patches, and then I guess Deckhand? It looks like this wasn't updated for Season 34, yet. In your update, if you continue to not include Dopplegangster, Big-Time Racketeer, and for synergy with those, Brann, I'd be curious about your reasoning. They seem made for Evolve Shaman as much as Dopplegangster does with Buff Paladin.